TaskRabbit, the San Francisco startup that has made a name for itself by helping people connect with odd jobs, is now a place where you can find a real job too. Today TaskRabbit is launching a new set of tools in its three-month-old TaskRabbit for Business portal that are designed to help companies hire ongoing temporary workers for jobs that will span over multiple days, weeks, or months. The TaskRabbit for Business portal launched in early March at South By Southwest, with the aim of helping companies there bring on staffers to help out over the course of the several-week festival. Since then, TaskRabbit for Business has emerged as the company’s fastest-growing segment of users, chief revenue officer Anne Raimondi told me in an interview this week, with 16,000 businesses signing up over the past several months. TaskRabbit now has 11,000 workers on its platform, 10 percent of whom use TaskRabbit as their sole source of income. With the newly expanded features, now businesses in all nine markets throughout the US where TaskRabbit is active can use TaskRabbit for Business to bring on a W-2 employee for work that takes up more than 15 hours per week. TaskRabbit, which will take a 26 percent commission on all W-2 classified jobs (normal tasks charge a 20 percent fee), will handle all compliance paperwork, including payroll taxes, workers’ compensation and unemployment insurance. Traditional temp agencies typically take a 40 to 60 percent commission, Raimondi says. It’s a big launch for the 65-person TaskRabbit that puts it squarely into competition with a new set of companies — the temp hiring industry is estimated to be worth some $230 billion annually and is dominated by huge global firms such as Adecco and Manpower. 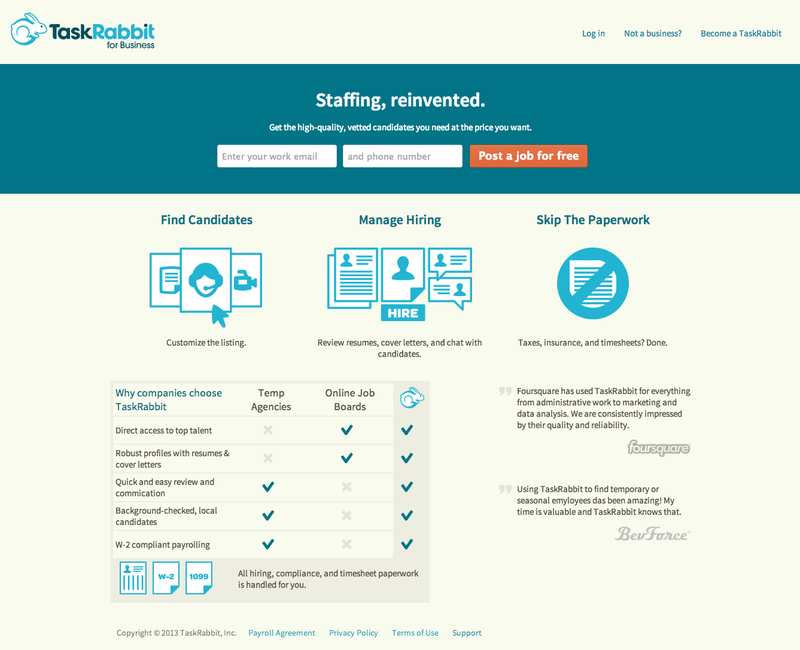 But in a way, it’s a very natural evolution for TaskRabbit, Raimondi said. Temp jobs will appear in the same stream as regular tasks on the TaskRabbit dashboard, but with a small icon of a briefcase to designate that they’re for ongoing positions. There are some small changes with how errand runners will display interest in the positions — pulling in more detailed resume information from LinkedIn, writing a cover letter, and the like. Small business task posting already accounts for 30 percent of the company’s sales, despite being a minority of the company’s users, Raimondi said. It stands to reason that making it easier for companies to do more things through TaskRabbit could allow the company to capture a bigger slice of the cash that goes back and forth in the business world. With enterprise hotter than ever, it’s no surprise to see startups that have made their names on the consumer front home in on the enterprise world as well. This could be a big boost for TaskRabbit’s revenue, if it all works out well.